Summoned by the Triforce, Link travels to the kingdom of Holodrum. Onox, General of Darkness, kidnaps the Oracle of Seasons and uses her to plunge the Temple of Seasons into the earth and cast the four seasons into chaos. 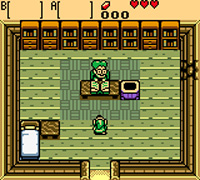 Using the Rod of Seasons, Link must track down the eight Season Spirits and return them to the Temple of Seasons in the underground realm of Subrosia. The Season Spirits are hidden in dungeons all over Holodrum. 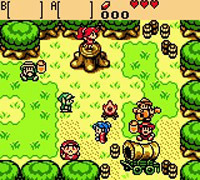 You can also collect Rings that will give Link new abilities. Head to south-east Horon Village and enter the house with a shed and a small lake. Inside you will meet Mr. Left who wants you to light the torches in his house for him. Mr. Left is based on Mr. Wright, the mayor's assistant in the SNES version of Sim City.